Amethyst was used as a gemstone by the ancient Egyptians and was largely employed in antiquity for intaglio engraved gems. The Greeks believed amethyst gems could prevent intoxication, while medieval European soldiers wore amethyst amulets as protection in battle in the belief that amethysts heal people and keep them cool-headed. Beads of amethyst were found in Anglo-Saxon graves in England. 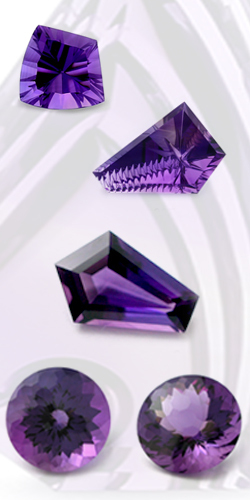 In the 19th century, the color of amethyst was attributed to the presence of manganese. However, since it is capable of being greatly altered and even discharged by heat, the color was believed by some authorities to be from an organic source. Ferric thiocyanate has been suggested, and sulfur was said to have been detected in the mineral. Up until the 18th century, amethyst was included in the cardinal, or most valuable, gemstones (along with diamond sapphire ruby, and emerald. However, since the discovery of extensive deposits in locations such as, it has lost most of its value. Collectors look for depth of color, possibly with red flashes if cut conventionally.